Francisco Díaz was released from prison Feb. 15, 2010. 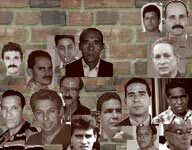 As with so many other Cuban prisoners of conscience, prison has been just another arena for Díaz to champion the cause of Cuban liberty. His jailers have responded in kind. In September 1997, according to Amnesty International, "over 30 prison guards at Combinado de Guantánamo Prison kicked and punched ... three prisoners while they were handcuffed. Jorge Luis García Pérez was beaten on the face, neck, abdomen, ribs and back; Nestor Rodríguez Pérez was beaten around the face and ribs, as well as being kicked so hard in the stomach that it caused him to defecate; Francisco Díaz Echemendía suffered injuries to his left arm and was also beaten on the neck, ribs, back and face, causing his nose and lip to split open. Almost 10 years later, it was more for Díaz, 15 guards at another prison, Boniato, guards beat Díaz, so badly, that he was admitted to the prison hospital in critical condition. Why Díaz is targeted for such treatment is not surprising. A member of the Pedro Luis Boitel Political Prisoner Association, Díaz has repeatedly denounced human rights violations by his jailers. As a result, the Cuban authorities have turned down requests for his release, most recently in 2004, making Díaz one of the longest-imprisoned dissidents in Cuba. For more on how you show your support for Francisco Díaz and other Cuban political prisoners, visit Bloggers United for Cuban Liberty.